- Stephen is taken to a rehabilitation centre. Brad comes round and tells Lauren he's moving out of home after a row with Pam. He wonders if Lou would let him board at No.24 and Lauren says she'll talk Lou into it when he gets home! She is very pleased at the prospect of having Brad living with them. Wayne and Phoebe are having a coffee. PHOEBE: Looks like my marriage is over, doesn't it? WAYNE: I wouldn't go that far! PHOEBE: Stephen obviously doesn't want me. WAYNE: Well, how do you feel about him? WAYNE: It's a shame you didn't tell him that before he left. PHOEBE: What would have been the point? Stephen made it pretty clear he doesn't love me anymore. WAYNE: You should have talked. PHOEBE: It's too late for that now. I feel like going away somewhere for a little while. She gets up and asks Annalise to look after the shop for a few days - she's going to visit Dorothy. Wayne tells her she shouldn't run away from her problems. The nurse tells Stephen that he'll be looked after at the Rehab Centre. He assures Stephen that Phoebe will be able to visit. STEPHEN: Thanks. But she won't be visiting. Julie answers the phone and crossly tells the caller that she and Phil have separated. She sits down to study, but then there's a knock on the door. 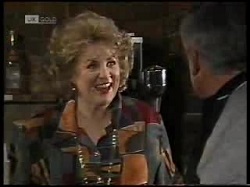 Helen has come to see how Julie is and offers to help her with the housework. Julie insists she's coping perfectly well, but she's stressed about completing her assignment. Helen decides to leave her in peace. Doug moans to Pam that Gaby won't tell them what the other bids for the job are. Pam is still cross about Brad's gambling. Annalise comes in and tells Helen that Phoebe has gone away for a few days. Helen is feeling a bit fed up and sorry for herself, saying her family can be very ungrateful. Annalise observes that Helen is drinking a fair bit of sherry and Helen gets very defensive. Phoebe is closing up the house to go and see Dorothy. Wayne suggests she gives Stephen a ring at the Rehab Centre, but Phoebe doesn't want to. 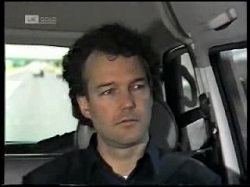 Stephen suddenly tells the nurses that he doesn't want to go to the Rehab Centre - he wants to go home. STEPHEN: I told me wife I didn't love her. But I do! I've got to sort it out. Just take me home. The nurse tells the driver to turn around. 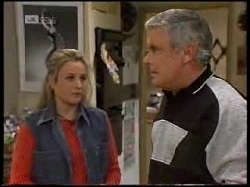 Phoebe puts her things in Wayne's car and they're about to head off to the station when a delivery van arrives with Phoebe's new washing machine. Lou tells Lauren that he's not sure that Brad should move in with them. He thinks Pam is right when she says Brad has a gambling problem. Lauren says at least they'll be able to keep an eye on Brad, and it's near to Pam and Doug. Lou finally relents, but says there'll have to be some ground rules. Julie is working on her assignment, but it isn't going very well - she spills a glass of water over her work, and then is interrupted by Annalise at the door. Annalise tells Julie that Helen has drunk two bottles of sherry in a week, and seems very lonely. Julie crossly tells Annalise to get lost. The washing machine has now been delivered, and Phoebe and Wayne are about to head off again when Stephen's ambulance draws up. Phoebe goes up to it and gets in with Stephen. He holds out his hand to her and they hug tightly. STEPHEN: I couldn't leave you. Lou and Brad are having a beer when the bar maid recognises him. BARMAID: Aren't you Lou Carpenter? LOU: Yes, yes. Do I know you? BARMAID: No, no, no, no, but I know you! I've seen your ads for the car yard. Larrikin Lou, right? BARMAID:(to Brad) Well, looks pretty good on the telly, doesn't he! BARMAID: Scrubs up OK in the flesh, too! He turns back to Brad to talk about the house rules for him moving in. Stephen is cuddling Hope. Phoebe is really happy that Stephen is home. STEPHEN: You're going to have to get used to this. I haven't changed, Phoebe, not really. I still love you. PHOEBE: And I love you. STEPHEN: I'm sorry I nearly ruined everything. I should never have said I didn't love you. PHOEBE: Well, I can understand why you did. STEPHEN: What if I'm never able to walk again? PHOEBE: Of course you will be! STEPHEN: It's going to be a long, slow road to recovery. There'll be problems. PHOEBE: And we'll work them out together, as a family. The barmaid is still hanging round. BRAD: I think she fancies you! ...God knows why. LOU: Oh, get out of it! Anyway, haven't got time, got a business to run. He heads off and the barmaid sees that he's left his wallet. She doesn't run after him with it. Pam is shocked to hear that Brad is moving out. He says Pam treats him like he's an idiot and says he's moving in with Lauren, and Lou has agreed! Pam thinks Brad is running away from his gambling problem. He just goes off to pack his stuff. Lauren has also agreed to the house rules for Brad, and says she'll keep an eye on Brad's gambling. Lou suddenly realises that he's lost his wallet and rings the pub. 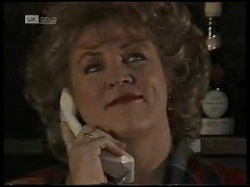 The barmaid answers the phone, "Cheryl speaking". She's very pleased to hear from him but lies and says she hasn't seen his wallet. He gives her his address in case it turns up. She smiles in triumph. Helen is having a sherry in the living room. Wayne and Annalise talk about Helen - she seems a bit upset. Wayne decides to have a chat with her. Helen is looking through the family album and tells Wayne she's fine. Helen shows Annalise some photos of the kids when they were little. One of the photos is of Ann. Helen sadly says how beautiful Ann was and tries not to cry. Brad gives Lou some rent money that he won at the TAB! Lou warns Brad that he's hooked on gambling, but Brad brushes this off. Helen and Annalise are still looking through the photo album. Helen almost knocks over the bottle of sherry and Annalise tackles the subject of Helen's drinking. Helen gets very defensive and then stumbles getting up. She ends up throwing Annalise out of the house! 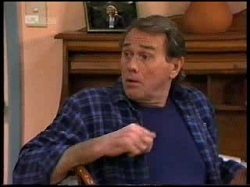 HELEN: I want you out of here right now! Go! I don't want you here! Go! GET OUT! OUT! OUT! OUT! She quickly pours herself another glass of sherry.